It is often assumed that the verbal and visual languages of Indigenous people had little influence upon the classification of scientific, legal, and artistic objects in the metropolises and museums of nineteenth-century colonial powers. However colonized locals did more than merely collect material for interested colonizers. In developing the concept of anachronism for the analysis of colonial material this book writes the complex biographies for five key objects that exemplify, embody, and refract the tensions of nineteenth-century history. Through an analysis of particular language notations and drawings hidden in colonial documents and a reexamination of cross-cultural communication, the book writes biographies for five objects that exemplify the tensions of nineteenth-century history. The author also draws on fieldwork done in communities today, such as the group of Koorie women whose re-enactments of tradition illustrate the first chapter’s potted history of indigenous mediums and debates. The second case study explores British colonial history through the biography of the proclamation boards produced under George Arthur (1784-1854), Governor of British Honduras, Tasmania, British Columbia, and India. The third case study looks at the maps of the German explorer of indigenous taxonomy Wilhelm von Blandowski (1822-1878), and the fourth looks at a multi-authored encyclopaedia in which Blandowski had taken into account indigenous knowledge such as that in the work of Kwat-Kwat artist Yakaduna, whose hundreds of drawings (1862-1901) are the material basis for the fifth and final case study. 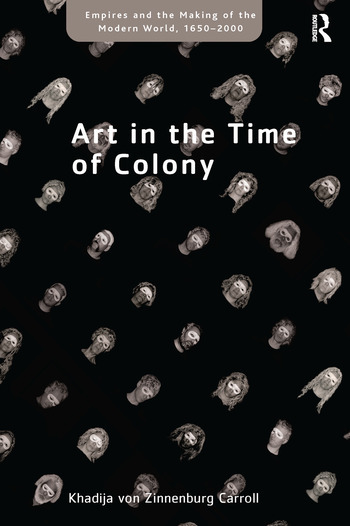 Through these three characters’ histories Art in the Time of Colony demonstrates the political importance of material culture by using objects to revisit the much-contested nineteenth-century colonial period, in which the colonial nations as a cultural and legal-political system were brought into being. Contents: Introduction; Mimesis of tradition; The picture proclamation; The encyclopaedia Terra Cognita; Anachronistic mapping; Telling race in silhouette; Conclusions and other performances; Bibliography; Indexes. 'The fascinating premise behind Khadjia von Zinnenburg Carroll's Art in the Time of Colony is an examination of how contemporary art has been used to stand in for gaps in the historical record of Indigenous Australians'.